Home » Advocacy & Action » 25% of Kansas Voters Set to Determine Your Future! Voting is the cornerstone of democracy. That’s why it always amazes and frustrates us that so few people eligible to vote actually cast a ballot. In 2014, the last time Kansas was electing a Governor, only 50.8% of registered voters bothered to vote. Think about that! 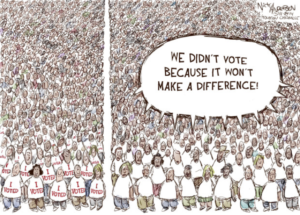 For every two Kansans, one did not vote! Just 25% of voters (half of those that bother to vote) could decide your future. Are you satisfied to let half of all Kansans registered to vote to decide what that future will be? Every election is important, but this year’s race for Governor offers us a particularly sharp contrast. Will the next Governor return to the Brownback tax policy or continue to move forward? Will the next Governor honor the school finance plan passed by the legislature or repeal it? Will the next Governor fund highway maintenance or steal for KDOT? The decision is up to us. And it should be up to ALL OF US! No matter where you sit on the broad political spectrum, please vote. Let’s find out once and for all what the MAJORITY of Kansans want, not just the half that shows up. You can vote early by mail. You can vote early in person. You can walk into your polling place on November 6. But however you do it, please support our democracy. Please vote. https://www.ksvotes.org is your one-stop-shop for voting. Go there to check your registration – make sure you haven’t been purged from the voter files. Go there to register to vote if you aren’t now registered. Go there to request an advance voting ballot if you’d like to vote from home. In your pajamas. There’s a bonus for early voting! Campaigns run on money. And no campaign treasurer wants to spend money they don’t have to spend. That’s why, once advance voting starts, a good campaign treasurer will check the voting rolls daily to see who in that district has already voted. If your name comes up as having cast a ballot early, they take you off the mail list to save money. So you see, if you vote early, you can stop most, if not all, of the nasty campaign mail from filling your mailbox! Now that’s a deal worth voting early for! I Vote for Public Education! Some candidates will say they support education, and they’ll do just about anything to fool the public into thinking they mean it. Often they’ll trot out a teacher who will say great things in support of the candidate, hoping that you and I don’t look at their record. Take the race between Sharice Davids and Kevin Yoder for Congressional District 3 as an example. While Yoder has found a retired teacher to appear in a commercial, Davids has the backing of educators throughout her district. And as a KNEA/KPAC recommended candidate, Davids has been through a rigorous interview process conducted by currently licensed classroom teachers who determined that hers is a candidacy that truly represents support for public education. Or look to the Governor’s race for another example. Secretary of State Kobach makes splashy headlines for what sounds like a pro-education policy, but when you investigate his rhetoric you discover that his promises- like his funding to the classroom slogan- actually will result in cuts. Why? Because he’s not telling you that he believes that only certain very specific things qualify as necessary for “classroom instruction.” Everything else like support services, technology, and specialists would only be funded at the local level- meaning that a child’s opportunity would depend a whole lot on their zip code. If you would love to vote but just aren’t sure who the pro-public education candidates are, we’ve got just the thing for you! The KNEA Political Action Committee (KPAC), made up of KNEA members from across the state, have done the hard work of interviewing and analyzing the candidates for public office. They have identified which candidates are the best on issues related to our public schools, our school employees, and our public school students. 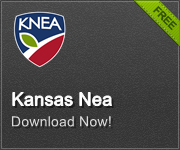 Click here to see the list of all KNEA/KPAC recommended candidates. I have emailed Senators Moran and Roberts to vote NO on Kavanaugh’s nomination. My biggest concerns are his Perjury (for which he could be disbarred and has violated his oath) and his blatant display of bias which cannot be tolerated on the court. These concerns disqualify him as a candidate. I am also concerned about perjury in the sexual accusations hearing and his ultra-conservative positions on women’s rights and his indebtedness to the Trump administration.